Try to be a Cupcake in a Muffin Kind of World! The Cake Lady has been exceeding Treasure Coasters expectations with the highest standards in quality, taste and design from their cakes to their cake pops. They have the backing to prove it. With awards from Wedding Wire Couples Choice, Hometown News Reader's Choice and more! 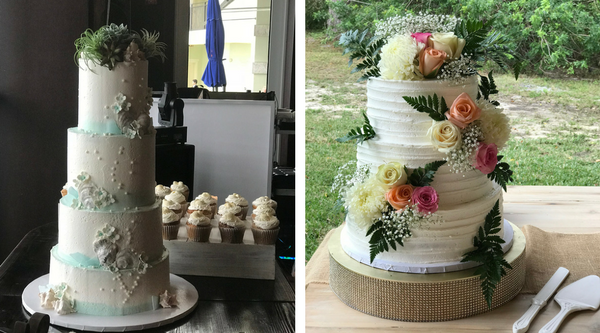 From wedding and baby showers to anniversary and graduation parties, The Cake Lady bakes all her cakes in the bakery - fresh. All cakes are baked with a special touch and designed by the client's wishes and style. A picture is worth a thousand words! Give your design picture to The Cake Lady, and she'll custom create your cake! Visit The Cake Lady Bakery located in Downtown Fort Pierce. The cakes, cupcakes and treats are perfect after your afternoon shopping stroll, date night out, or theatre show. Customers hail from Sebastian to Palm Beach. Enjoy your favorite treat, in their quaint location! All cakes are created fresh in our bakery and never frozen. We are fully licensed, certified and insured. The Cake Lady's list of charity's she supports in the community is ENDLESS! From cupcake and cake donations at local galas and chamber meetings to monetary donations and volunteering, the generosity is TOO SWEET! The Cake Lady offers baking classes of all kinds! Get festive with next upcoming holiday by checking out the event line up! Make it a fun kids class or a girls night out! Whether you are joining to learn or just have fun, you'll be going home after an entertaining night with great dessert! Summer is right around the corner! Stay tuned for more information on Cake Lady's Cupcake-Filled Summer Camp! Fort Pierce's Cake Lady, Staci Dunn has been Feature on Food Network's "Cake Hunters!" The show is a design challenge between three bakeries. Staci had the privilege to design an amazing cake for a family that had very different opinions about the type of cake that should be served at their son's bar mitzvah.